The first Skeptical podcast that I ever listened to was Skeptoid. Along with The Skeptics’ Guide to the Universe, Skeptoid is among the most recognized and listened to podcasts within the fledgling Skeptical community. Skeptoid was created in 2006 by its host and producer, Brian Dunning, a computer scientist by trade and intrepid Skeptical advocate by night (and sometime Rubik’s Cube hobbyist). A new Skeptoid episode is released every week and each episode usually lasts around 10-12 minutes. After eight years Skeptoid’s library has surpassed 400 episodes (and counting! ), covering all of the usual suspects, including, Bigfoot, UFOs, quack therapies and popular conspiracy theories, but also, as you might imagine with SO MANY episodes Skeptoid often surprises its listeners with obscure legends and hoaxes. The Skeptoid logo, as seen on the Skeptoid website, is an eye and Brian Dunning will often begin a podcast by saying that he is “pointing the skeptical eye” at a claim. The Skeptical Eye tattoo gets high marks for Skepticism on the Skeptic Tattoos Meter because the inspiration comes straight from the modern Skeptical movement. It also scores well in the aesthetic categories because the eye is just such a naturally compelling subject and usually looks pretty good in tattoos and it also picks up some bonus marks for whimsy thanks to the clever/cheeky addition of the teardrop, but to learn more about that story you'll have to click the link below. 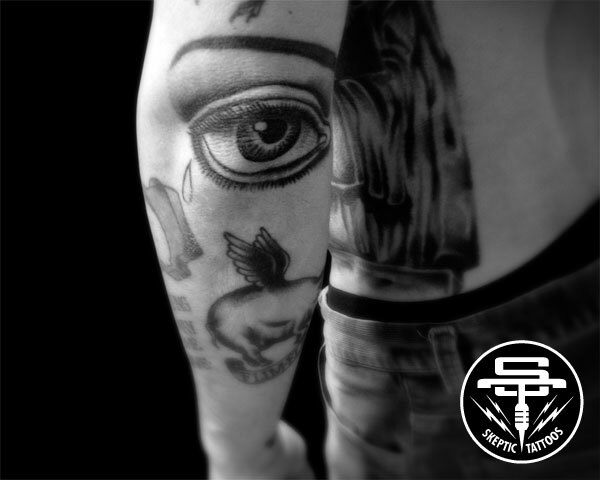 Learn more about the Skeptoid podcast and the inspiration for "The Skeptical Eye" tattoo.